Today’s pedal line is from Mark Rubenstein. If you have a pedal line (doesn’t have to be in a board) for your rig, please email me a photo, bio, description of pedals and routing to pedalline@nulleffectsbay.com. Every Friday I’ll showcase a pedal line submission. Make sure you include any links to your band or music page. Attached is the latest in my ever-evolving pedal board. Pedals come and go, but this one should meet my needs for a while. I play various styles, including blues/rock, rock and jazz fusion and find that these pedals provide me with a wide variety of sounds for all occasions. 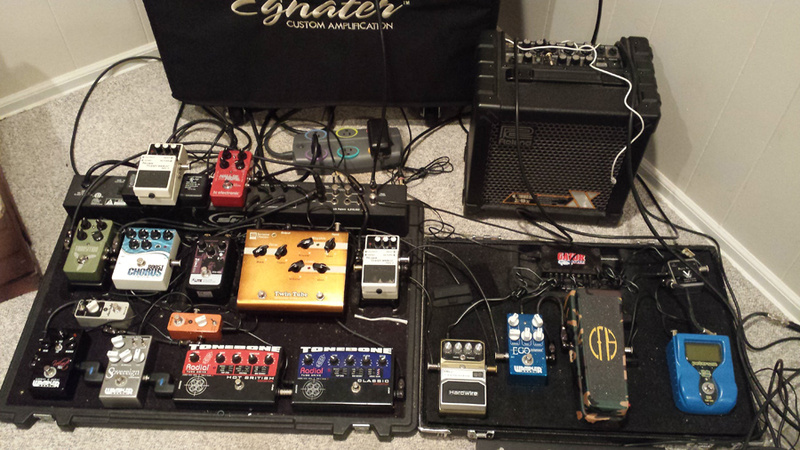 As you can see, the pedals span across two boards with most residing on an SKB PS-45 powered pedalboard. I will likely move to the largest Pedaltrain with Voodoo Labs power supplies in the future. However, I do like using the SKB’s patch bay for signal routing. 1. Coming out of the SKB PS-45 patch bay, the first pedal is a Visual Sound Pure Tone Buffer. This helps change the signal’s impedance to avoid the high end loss that occurs with the use of several pedals and cables. 2. Peterson StroboStomp tuner (super accurate). I also keep one of these on my workbench for intonation purposes when changing strings. 3. Dunlop Crybaby From Hell Wah Pedal. I like this one for the selectable settings and the tension adjustment feature. I don’t like very trebly wahs and this one allows me to choose a setting that is more “throaty” and vocal. Despite its association with Dimebag Darrel from Pantera, this wah gives me a great range for more classic rock and blues. You just have to spend some time dialing in the various options. 4. Wampler Ego Compressor – I love this compressor. I’ve tried so many and this one rules. One of its best features is the Blend knob that allows me to blend in the dry sound with the compressed sound. I set it for moderate compression, not for the chicken-picking sound many country players use. It really evens out the sound and adds sustain to clean and overdriven sounds. 5. Boss NS-2 Noise Suppressor – This is one of two in my pedalboard. This one is used for its loop through which most of the following pedals are routed. This eliminates the hum from the overdrive and distortion pedals. 6. Moen UL-VB Jimi Zero Vibrato – This is an inexpensive Univibe clone that I use for Hendrix and Robin Trower style songs. It sounds best before overdrives. 7. Digitech Hardwire CM-2 Tube Overdrive – This pedal is a real sleeper, but I love it so much more than the ubiquitous Tube Screamer due to the EQ tweakability. Great natural tube overdrive sound in the first mode. It also has a second mode that adds more grit and sustain. Using higher gain levels in this mode approaches distortion sounds for searing blues/rock leads. 8. Seymour Duncan Twin Tube Classic – this tube driven pedal gives me the singing and warm sustain I need for Santana and Eric Johnson type tones. This is one of my favorite pedals and will likely stay on my board for a long time. It’s a bit large, but worth it. 9. Radial Tonebone Classic Distortion – this is a tube-driven pedal that has a lot of tweakable options. It provides a wide variety of American-style overdrive and distortion flavors. I typically use it for a low or medium overdrive for sweet Allman Brother style leads. Very sweet sounding pedal. 10. Radial Tonebone Hot British – this is a tube driven British style Marshall in a pedal. Lots of options, but sounds great for 80’s style sounds. I can get a very convincing Van Halen tone with this pedal. 11. Wampler Sovereign – this is a recent addition. I love the way its “Mid-Behavior” knob lets me cut through the mix. I often use this as an alternative to the Seymour Duncan Twin Tube Classic for a slightly different tone. 12. Wampler Velvet Fuzz – I searched a long time for a fuzz that was smooth rather than nasty and this one is AMAZING. Easily nails the David Gilmour and Eric Johnson fuzz tones. The “Big” mode sounds like a fuzz into a overdriven Marshall amp. Absolutely wonderful. I have become such a huge Wampler pedal fan. 13. Mooer ElecLady Flanger – saw this at a guitar show with several others from this new company that makes a huge variety of micro-sized pedals. Provides a very wide range of flanging sounds from subtle to over the top. I use it for a light flanger to add some color to solos. 14. Mooer Ninety Orange Phaser – a great micro-size clone of the famous MXR Phase 90. The output of this pedal goes back to the Return jack of the first Boss NS-2. The output of the Boss NS-2 goes into the SKB PS-45 patch bay. The following pedals are in my amp’s effects loop, which first feeds into the SKB PS-45 patch bay. 16. TC Electronics Transition Delay – an variation of the TC Electronics Flashback. 18. Boss NS-2 Noise Suppressor – this one is used in my amp’s effects loop to reduce any hum or hiss when using the dirty channel of the amp. The output goes back to the SKB PS-45 patch bay. Note: The Roland Cube 20X in the photo is just a practice amp, not the one used with the pedalboard. ADMIN REMINDER! – Don’t forget to enter the T-Rex Replay Box Delay Give Away! Also, if you have a pedal line, please submit it for Pedal Line Friday!